Today the National Soccer Hall of Fame announced the official Class of 2018. The induction will take place on October 20 in Frisco, Texas. Don Garber: This is one of those rare cases where you can argue that an administrator is the headliner for a sporting hall of fame. 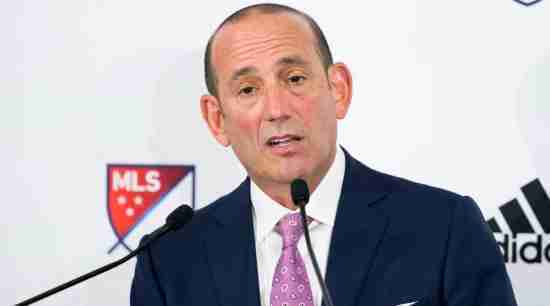 Don Garber was named the commissioner of Major League Soccer in 1999 and nobody can dispute that the league has grown leaps and bounds under his watch. There are now 23 teams from the 10 in 1999 and he ushered in long term national broadcasting deals. Attendance has rose from an average of 14,000 to 22,000 since he took over. Incidentally, Garber was chosen for the Hall in 2016 but deferred it to this year. Brad Friedel: Currently the Head Coach of the New England Revolution, Friedel represented the United States in net in three World Cups, two Olympic Teams and played in 82 Games for the National Team. He would set a Premiere League record with 310 consecutive games played over a spell with Blackburn, Aston Villa and Tottenham. Cindy Parlow Cone: Parlow Cone won championships everywhere. She was a three time champion at the University of North Carolina where she was also a two time Hermann Trophy winner. Internationally she represented the U.S. in 158 Games where she scored 75 Goals. She would help her country win the 1999 World Cup and two Olympic Golds and one Olympic Silver Medal. Dr. Bob Contiguglia: Contiguglia was the President of U.S. Soccer from 1998 to 2006. Tiffany Milbrett: Milbrett played 206 Games for the U.S. National Team and scored 100 Goals. Milbrett helped the Americans win the 1999 World Cup. She also holds the distinction of between one of two women (Mia Hamm being the other) of scoring 100 Goals in both International and NCAA competition. We here at Notinhalloffame.com would like to congratulate the new members of National Soccer Hall of Fame and the Hall itself as it continues to grow in prestige.